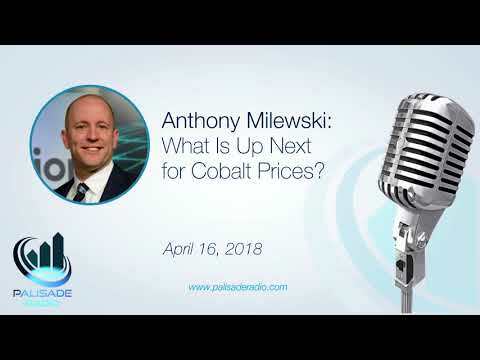 Videos - GOLDINVEST.de | Das Portal für Edelmetalle und Rohstoff-Aktien - Anthony Milewski: What Is Up Next for Cobalt Prices? o subscribe to our newsletter and get notified of new shows, please visit http://palisaderadio.com Anthony discusses how and why they entered the cobalt market. They were looking for investment opportunities when they realized that various disruptive technologies would be coming. The electric vehicle was one such technology, and they recognized that battery demand would soar. Two years ago they identified that cobalt would be in high demand and that there are very few cobalt mines in the world. They soon realized that there was a lot of hurdles in starting a streaming company, so they began accumulating cobalt from the market so they could have an IPO. He says, “There really are no other stockpiles of cobalt other than the Chinese government's supply.” Cobalt 27 has accumulated 3000 metric tonnes (370 million dollars) and recently raised 200 million to invest in streams. He says, "The best investment in the electric vehicle space is in cobalt regardless of which car companies win, cobalt will be needed." There will be a high-demand for a company with assets like Cobalt 27. Since they do not get supply from the Congo that should increase shareholder value as car companies will be looking for such a supply. This coupled with a streaming model will give the company excellent upside potential. The increased demand and prices of cobalt have not changed the needs of the market but has brought awareness of the increasing need to develop projects. E.V. penetration rates estimates are going to require at least a doubling and possibly a tripling of battery production. It’s possible that penetration rates by 2025 will be even higher than estimated.